Hi - I had an old lab PC running software made in CX-Supervisor to control equipment attached to a CP1H (I did not make the software). The CP1H connects to the PC with a RS232. The PC running the software died, but I have the files copied onto a new PC. I have installed the latest CX-Supervisor software, when I open my program file from the old PC I have a communication error (attached). Where do I setup the new PC to communicate with the CP1H? In CX-Programmer in the left most window, there should be Settings. Click Settings, then choose the appropriate port. See attached. You should be able to configure the port as needed. You will need to cycle plc power after you save the settings. Where do I setup the new PC to communicate with the CP1H? I think he is asking how to setup the new CX Supervisor PLC setup. the same thing happened here also, customer has replaced old PC with Windows XP with the new one, with Windows 10 and just copied the runtime folder to the new PC (installed previously the old cx-supervisor 1.33 (1)). Everything works, except for just two, out of ten PLCs cx-supervisor is communicating with, we get the same message as stated above: cx-server manager error etc, and it cannot open these two PLCs. Here, we have ethernet. 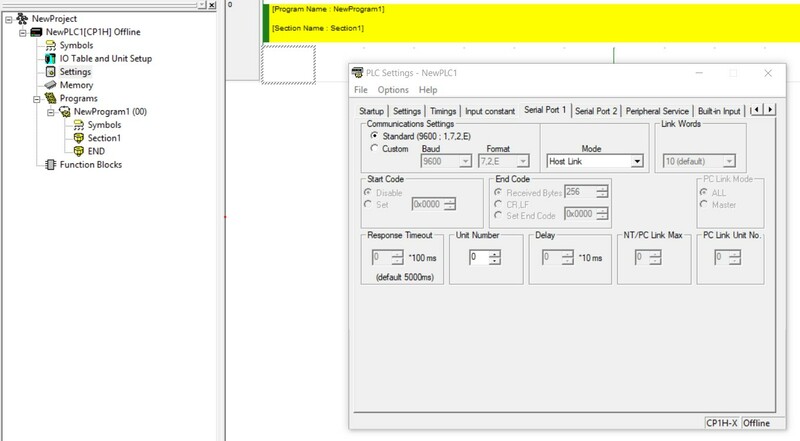 And in PLC config all plcs are configured with ethernet except these two which have ethernet (FINS/TCP) configured. We will try to change this and see what happens. Maybe this could have something with user rights also? Windows 10 is very restrictive with that, especially with system partition C, where cx-s runtime folder is located.